We’ve just produced these fabulous little cards in their own special carton for EasyRead Time Teacher. 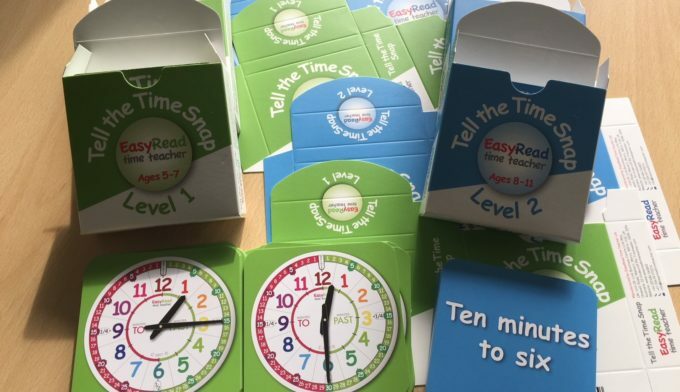 EasyRead Time Teacher Ltd is a family business dedicated to helping children and adults overcome the problems encountered when learning to tell the time on analogue clocks. The cards printed on 350gsm silk stock round cornered while the cartons are printed on 450 micron folding box board. The cards were then, die-cut, round cornered and matt laminated all in house. The set has been printed on our very own High Definition digital Jetpress 720s giving a consistency of colour throughout. The cards form part of a range of teaching materials available from EasyRead. The range includes watches and clocks plus a range of classroom aids. To find out more visit the EasyRead website here. Kingfisher Press can print a wide range of cartons and boxes, short and medium run to suit a variety of different products and specs. Read our blog here about a Game including cards, notepads and score cards that we have printed recently which has been a great success! Whether you want a prototype, presentation or pitch sample or something to make your product standout on the shelf we can help! To find out more about out High Quality Digital Print or more about what else we can offer at Kingfisher Press please visit our website here.